“A visitor to Orlando may not expect to find arts and culture–They expect to find Theme Parks,” states Jim Helsinger, Artistic Director for the Orlando Shakespeare Theatre. Number One son and I are sitting at a table in the lobby of the Lowndes Shakespeare Center. We have just watched an incredible, new play entitled, Wittenberg by David Davalos. Jim was one of the leads. He took a moment to speak with Brandon and I after the final performance of the play. This was the third year that Number One Son and I were blown away by a new play’s premiere at this theatre. In addition, we have seen several Shakespearean productions and other traditional and contemporary works in one of the four small theatres that comprise this complex. I have also accompanied Number One Daughter’s Montessori School on a couple of afternoon field trips to see a Shakespearean play as part of the theatre’s commitment to educating young people. Every show I have seen has been exceptional. I have been to shows on Broadway, Off Broadway and regional theatre productions throughout the country. I have seen professional touring productions in Los Angeles, Washington D. C. and Cincinnati. I have seen musicals & plays in London, ballets & Russian folk dances in St. Petersburg, as well as Shakespearean productions at the recently re-created Globe Theatre near the banks of the Thames. I have even appeared on the professional stage myself and was a theatre major for my undergraduate studies. But I have never seen a theatre consistently produce so many high quality works of art as the OST; performance after performance, year after year. Jim Helsinger has been with OST for seventeen of the 20 seasons it has been in existence and he is also a faculty member at UCF. I was grateful that he took a few moments after his final performance to chat with Brandon and I.
I ask him if he wants me to convey any special message in my blog and he is quick to sing the praises of all the organizations that make up the Loch Haven Park complex, where OST is headquartered. In addition to the OST in the Lowndes Shakespeare Center, there is the Orlando Museum of Art, the Mennello Museum of American Art, the Orlando Repertory Theatre, the Orlando Philharmonic Orchestra and the Orlando Science Center. It’s a thriving cultural center that not many visitors to Orlando take advantage of or even know about. Jim knows that the majority of people visiting the Orlando area come for the Theme Parks. But for the lucky few who have found this blog–The well informed traveler looking for “more than a mouse”™–They will discover a show at the Orlando Shakespeare Theatre. And they will be so glad they did! While I am quite possibly the only person in America never to have seen the hit Reality TV Show upon which this attraction is based, Number One Daughter has. (And she’s a fabulous singer, if I do say so myself.) Last week, she asked to audition for the theme park attraction. I began planning the transition from Orlando vacation rentals business owner to Stage Dad! By now, you probably have read her blog post about the audition experience. She’s quite a kid! (Excuse me, Sorry Amber, I meant to say, “She’s quite a young lady!”) The Producer, on the other hand…Well, we’ll get to that later. 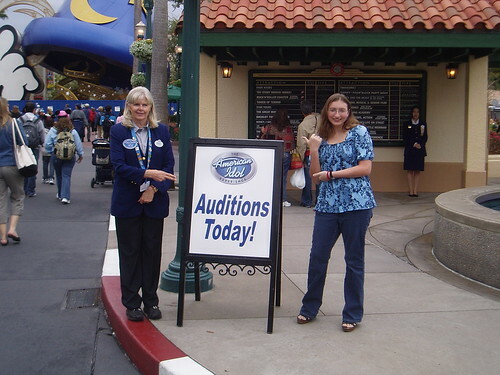 In the Disney version of the show, theme park guests audition to be contestants on the American Idol Experience. Twenty one guests are chosen to perform each day (three at each of seven preliminary shows throughout the day) and the winner of each preliminary show goes on to compete at the finale show that evening. For those of you looking to be the next American Idol, check back next week for step-by-step instructions on turning your Orlando vacation into lucrative record deals. For today, I just want to share some thoughts with you about the attraction. Perhaps the true star of the American Idol Experience is the stage itself. 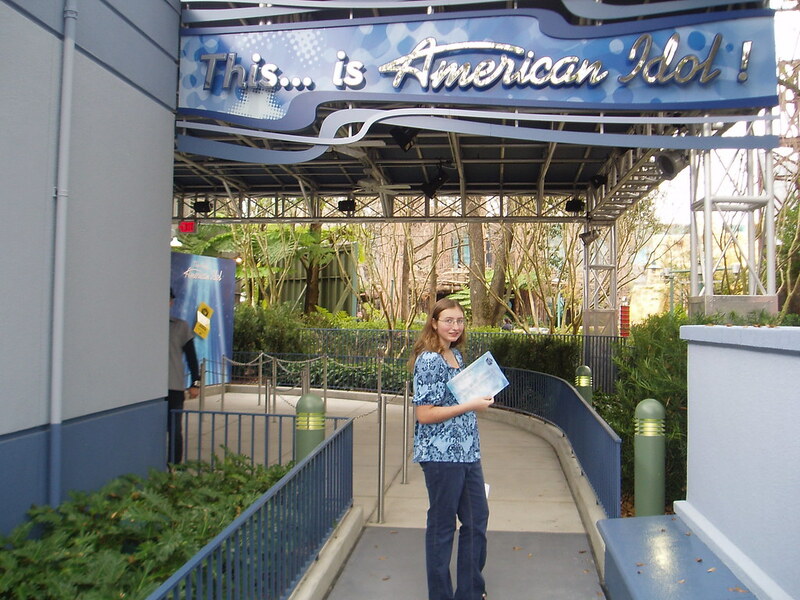 A Disney cast member said that it is as wide as the real American Idol stage, but not quite as tall. The background video screen is the same height as the real one. The theatre holds just over 1000 theme park guests. The stage looks similar to what I have seen when I have walked through my living room and Number One Daughter is watching American Idol on TV. There are three seats on stage right for the contestants and three seats and a table on stage left for the judges as well as a lot of room in between for the performances. The performers are also wired with a transponder that is used by the fabulous lighting elements of the show. When a performer walks around the stage during their performance, the transponder signals the lighting and the spotlights follow their movements. One Disney cast member bragged that it was the most technologically advanced show at Disney. After seeing the show, I’m a little skeptical about this claim; however, it is a very impressive set. At the top of the hour, the theatre begins to fill and a Cast Member comes out to warm up the audience. During the show I attended, he was, bar far, the highlight of the show! He was witty, energetic–The perfect precursor to the rest of the show. Next, the judges are introduced. From the reaction of the audience, it is clear that they have adopted personas similar to the real judges on TV. There’s even a judge in the attraction named “Simon” who is a cantankerous, petulant fellow with a British accent. The judge he emulates on the real TV show is probably not a very popular or well known person…Just kidding! 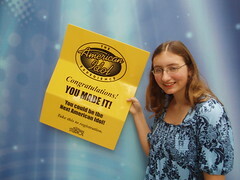 I’m not quite that unaware of the American Idol phenomenon! The “Simon” character appears to relish his role as the most negative of the judges. The attention to rejection is obvious as the host works hard to get the audience to diminish the impact of negative feedback and to offer supportive cheers for each performer. Although I didn’t go to the finale show, I understand that with seven performers (the winner of each preliminary show) it lasts 45 minutes and ends with the presentation of the Golden Ticket and a confetti shower. As an audience member, the American Idol Experience is quite a show. But I do believe this new attraction will cause a problem for Disney: How will they deal with having to “reject” so many guests? Disney specializes in positive, feel good guest interaction. How are guests who don’t win “Best Singer” (or even make it past the Casting Director) going to respond to the rejection of American Idol? With only twenty-one daily slots on the show and only one “Best Singer”, there will be a lot more losers than winners. It will be interesting to see how Disney deals with this issue as they get feedback on how guests receive this attraction. I know that Number One Daughter was deeply disappointed when she made it to the Producer, only to be told that she would not be appearing in the show. And as her father, well, “disappointed” does not come close to expressing how I feel about the Producer who dared to…Oops, I digress. Another interesting thing I observed was that if a guest made it beyond the “Casting Director,” they were put in an area Disney cast members were careful to refer to as “The Coke Room” to await the audition for the Producer. When I watched Number One Daughter audition and then during the subsequent show itself, I deliberately looked for the words “Coke” or “Coca-cola” but couldn’t find them anywhere in the audition area or the actual theatre. However, in addition to featuring “Coke Red” decor and the “Dynamic Ribbon Device” motif in the “Coke” room, you occasionally spot the familiar coke shaped bottle and glasses both in the “Coke” room and on the American Idol Experience set. I got the impression that Coca-Cola has paid a lot of money to sponsor this show. It appeared that they are following in the footsteps of the Nike “Swoosh” by attempting to create a subconscious connection between a shape (the “Dynamic Ribbon Device”) a color (bright red) certain glass and bottle designs (the familiar Coke bottle and Coke glass) and the Coke brand. I enjoyed the incredible sets and staging of this attraction. The dramatic tension was also obvious, creating a very entertaining show. Guests will really enjoy this latest offering from Disney, especially if they are already a fan of the TV show. It obviously gives the feeling that you are at the actual TV show. Given the TV show’s popularity, this attraction is sure to be a hit. I only hope it lasts longer than the “Who Wants to be a Millionaire–Play it!” attraction that seemed to open just as the popularity of that TV show was waning and the attraction closed just a few short years later. Anyway, after we watched the American Idol Experience, Mrs. LanceAround, Number One Son, Number One Daughter and I strolled over to the Toy Story Mania Ride. A cast member there was bragging that Toy Story Mania has become the busiest attraction at Disney World and I believe them. It’s a fantastic ride that can be enjoyed by the entire extended family. Best of all, it does not tell your Number One Daughter she can’t be on it! I was excited–Not knowing what to expect–Hoping to do well. My nerves peaked until I got to the Producer. Then, it was over. I’m getting ahead of myself. Here is what happened. I walked into the audition. I entered a small foyer and watched a short video. Disney workers then guided me down a hallway and I waited until the first audition room was available. My dad had to sign some paperwork. If you are under 18, a parent has to go in with you. You have to be 14 or older to audition. My dad was in the room and that was kind of reassuring in a way, thinking about him, and not the audition. He would encourage me to “punch it” and “shine.” Good advice. I was expecting to sing in front of three judges who would tell me to either go on the show or go away. Instead, it was just one person. The Casting Director was sitting behind a small desk with a computer and clipboard. She asked me my name, age and what I was going to sing. She told me to sing. She stopped me twice because I was having problems with my breathing techniques. She asked me to relax because she could tell I was a little nervous. That was nice of her. I’m not sure many people would be willing to help me like she did. She helped me to focus and to project my voice. Enclosed in a small room…With a complete stranger…Asking me to perform for her…In short…Nerve racking! I could barely keep my pitch in range and I faltered. I failed. I tried to keep in range without squeaking or going flat. The Casting Director said that she was going to let me go on to the Producer, who is the higher judge. I was very happy and proud that I got past her. She said that only 10% of the people get past her, so I was even happier because I did not think I nailed that audition. But I did! She gave me a clipboard with my official American Idol number on it. I walked out of the room and all the Disney workers clapped for me when they saw I had the clipboard. I heard them do that for other people as well. They gave me an Ipod with over 100 songs. I have to sing one, Karaoke style, for the Producer. The list has all the songs you are allowed to choose for the actual show. They do not repeat any of the songs for that day. Once someone is selected to go on the show, they choose a song and no one else is allowed to pick that same song that day. But when I went in front of the Producer, I choked, and it hurt my score. It lost me my chance. When you go to the Producer, you have to be able to perform. You have to be a star, have pitch, punch it. You have to, as my dad says, SHINE! When I finished my song, he asked me a few questions. He was very surprised to find out I was only 14. He said that I have a lot of raw talent and I should practice more. It was said in a very encouraging way–Not mean or hurtful–Very nice. He said I was not right for the show and he shook my hand and I left. The helpers guided me to the door and I left. I was about to start crying. I was disappointed. I don’t know…It just kinda rose my…I kinda became hopeful…And kinda crashed. Not a very large percentage that go to the Producer get to be on the show. So I did not end up crying. But I wanted to. I turned my back and went back to my school. Don’t be too disappointed if you don’t make it. Don’t, like, hate Disney for it. I’m thankful that I got as far as I got. Yep! LanceAround Notes: Can you imagine how proud I am to be her father? 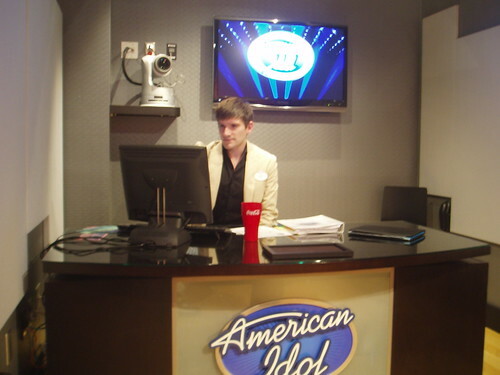 Please come back to LanceAroundOrlando on Sunday to read more about The American Idol Experience. Oh, and by the way, she was MUCH better than the ones who were selected to perform in the actual show in front of the audience. But I’m guessing you had figured that out already. I stand under the concrete structure and stare through the enormous round hole above my head. It is a simple edifice– four concrete pillars in each corner, about thirty feet apart and about twenty feet high, supporting a concrete slab with a perfectly round hole about 20 feet in diameter above my head. I can see the clear blue sky and white billowing clouds of a perfect Florida afternoon. I know that on Friday, 27 January 1967 at 6:31pm, a small spark in a tiny capsule approximately 100 feet above where I am now standing created a flash fire that took the lives of Gus Grissom, Ed White and Roger Chaffee. Deke Slayton was standing in the launch bunkhouse, just a few yards away. He ran to the capsule, hoping against all reason that somehow the three men survived the fire. Nowadays, the launch control room is located so far from the Shuttle, you could not possibly run there in just a few moments. I am surprised to learn that for the Mercury, Gemini and early Apollo flights, the bunkhouse was in a bunker right next to the rockets that are about to launch. Our tour takes us into another small bunker and I peer through several layers of thick glass. I put my hand under a Plexiglas buffer and literally click the same button clicked over 40 years ago to send one of the Mercury astronauts into space from the launch pad I can see just a few hundred feet outside the thick glass. There is even a real, life sized Mercury Rocket sitting on the launchpad. The tour guide describes the people and conditions that occupied this very same room during that historic moment when I was too young to even begin to comprehend what it all meant. I have seen many specials, read many books and talked to many people about the NASA space flight programs–But today’s tour taught me unimaginable new things. It is one of two “behind the scenes” tours that KSC (Kennedy Space Center) Visitor’s Complex offers. Had my good friend, JediBFA, not insisted on taking this tour, I would have never known about them. The KSC Visitor’s Complex combines all the essential elements of an ideal vacation spot. There are interesting and historical things to see, just like a museum, an abundance of educational opportunities, the chance to meet with humans who have “slipped the surly bonds of earth”* and traveled into space, IMAX movies, guided tours, theme park-like attractions, a live-working launch complex and, of course, plenty of food and gift shop items to satisfy everyone. In addition, there is a camp program, occasional shuttle & rocket launches, astronaut training simulations and the chance to have lunch with one of the astronauts. The astronaut memorial and hall of fame are also close by. To top it off, the pleasurable surf of Cocoa Beach is just a few minutes to the south. The KSC visitor’s complex is open every day of the year, except for Christmas and during some launches. It is much less expensive than a one day ticket to see the mouse, even when you add the extra for a behind the scenes tour or lunch with an astronaut. With careful planning, you can even get a pass to be inside the center during a shuttle launch–The closest vantage point available for anyone who does not have a special connection to a NASA employee or high ranking politician! But be careful–Be sure to plan your launch watch early in your vacation window so you can make the necessary adjustments should the launch experience one of their many, common delays. As I watch my three children tour the space center with Mrs. LanceAround and JediBFA, I notice how the many displays catch their attention, invoke their imagination and create enthusiasm. While I find the Space Center to be perfect for anyone traveling to Central Florida, parents with children would be remiss if they did not avail themselves of this great opportunity for educational fun. KSC is located only 45 minutes away from the Theme Park area of Central Florida. I highly recommend that you plan to take a break from the mouse for at least one day to see this extraordinary place that has witnessed pieces of humankind’s greatest history and yet still holds such promise for the future of all humankind!